﻿ Sokcho Marine Pension, Sokcho-si | FROM $51 - SAVE ON AGODA! Have a question for Sokcho Marine Pension? 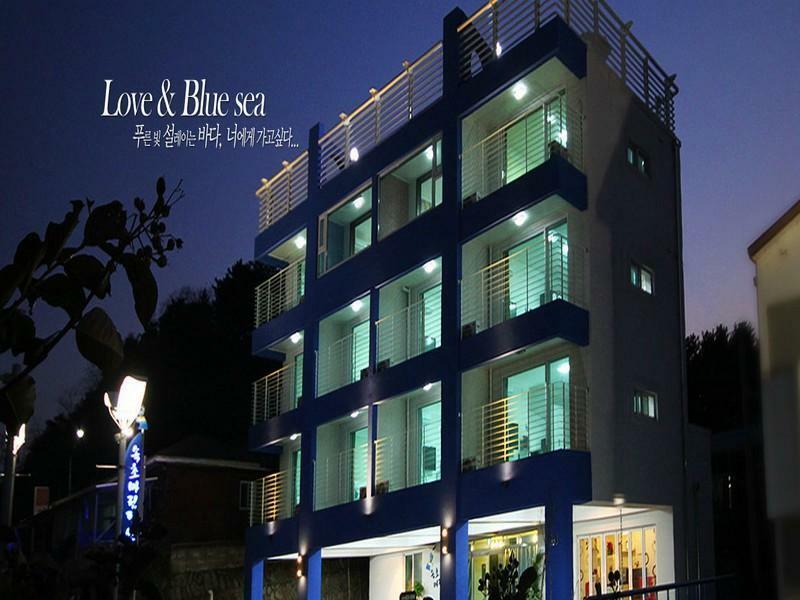 Situated in Daepo-hang, Sokcho Marine Pension is the perfect place to experience Sokcho-si and its surroundings. From here, guests can enjoy easy access to all that the lively city has to offer. With its convenient location, the hotel offers easy access to the city's must-see destinations. Sokcho Marine Pension offers impeccable service and all the essential amenities to invigorate travelers. Guests of the hotel can enjoy on-site features like free Wi-Fi in all rooms, luggage storage, Wi-Fi in public areas, car park, family room. The hotel features 10 beautifully appointed guest rooms, many of which include television LCD/plasma screen, non smoking rooms, air conditioning, desk, television. Besides, the hotel's host of recreational offerings ensures you have plenty to do during your stay. Sokcho Marine Pension is a smart choice for travelers to Sokcho-si, offering a relaxed and hassle-free stay every time. The location was very good. We were able to walk to the beach and the harbor. We really enjoyed the area. The staff did not speak any English. But they were always available and helpful if we needed something. The "breakfast" was not really breakfast. We took our coffees to-go and picked up some food elsewhere. They also stocked with less than basic amenities. They didn't even leave an extra roll of toilet paper. This caused some shock and irritation when we didn't notice until it was late at night....an extra roll stocked in the room would be a nice gesture. We enjoyed our stay but wouldn't stay again. Poor value for money. In a construction zone, small towels, lumpy bed, one shared microwave. Staff very nice and helpful. its overated and they dont clean day per day the room. The room has a beautiful scene. It is near to the beach and have sea view. The room is clean and tidy. It is almost excellent to live in here with this room price. But there is no hot water for bathing. I don't know why. I have knocked the door of the hotel office but no answer. It seems that they have out for somewhere but it is only 7:00pm. I have left a paper and spell out our situation through the door edge. The hot water resume around 9:00pm but nobody comes to tell us the reason. However, I still think that it is worth to stay here for this price. I would definitely stay here again. This pension was very clean and modern. The owner spoke enough English to point me in the direction of the bus stop and call cabs for me, and was very friendly/accommodating. Location-wise, it is about a 15-minute walk from the bus terminal/"main drag," which was nice because it was a bit quieter. I brought my bike so being a little further away from things was ok for me, but I'd probably like to be a bit closer to things without having a mode of transportation (although there are restaurants and GS's nearby). It's also near a bus stop that took me into Soraksan for hiking, which was great. All in all, I definitely enjoyed my stay here! Overall our stay was great. The bed was a little hard, but nothing we couldnt handle for two nights. We had a queen bed with a dining table, one hot plate, a tv, a small fridge/freezer,computer with internet access, a deck, and shower. Dishes and utensils were provided, but if you are in a larger group, I would advise you bring paper plates and cutlery. The owner was very nice, he barely spoke English, but we used our translator app to speak with him. We got a ondol (traditional korean sleepmat) and two pillows with a blanket for our children to sleep on. The location of the hotel was close to the beach and we were able to see the subset on the roof and see the beach from the deck in our room as well as the roof. The owner also had 4 grills on the rood which we used two while we were staying there. He was very helpful. We brought all of our food for the weekend, which helped save money :) we would definitely stay here again. The room is cosy with a balcony which can view the beach of sokcho. Less population around makes me feel comfortable. The room is clean and tidy. The location is far away from the bus stop to the spots of sokcho si. No restaurant and convenient store nearby. We booked for 6 people and was given a double bed, 2 comforters and 2 bedsheets...Here's the worse part; it came with breakfast and we were given a total of 6 slices of bread; one slice each...yes! one small slice each!...when we asked for more; the owner just coldly said one slice for one person...and one small cup of coffee each...I had to drive out and bought some more bread...hello; how much does a bread cost compare with your reputation!!! I will never stay at this hotel again...NEVER! Friendly owner which allowed us to check in early, personally prepared light breakfast and most importantly superb location. Great! The owner is helpful, close to seafood market but expensive, close to bus stop to the seorak mountain , just walking distance , close to the beach , a very nice place to travel. Very comfortable stay. Large, clean and comfortable room. Walking distance to the beach and Daepo Harbour (good place for seafood sashimi). Good base for exploring Mt Seorok. Overall a good place to stay in. Located right at the end of Sokcho beach stretch, may face difficulty with Taxi drivers but once you are on the road alongside Sokcho beach its easy to find. 10min walk to bus stop to get to Seoraksan National Park. Sokcho city area is 15min taxi ride away. Room is huge with a nice balcony overlooking the beach. We went for a weekend at the beach. It is very close to the beach but not too close to anything else. The building and room were new and clean. The staff was wonderful. There was a man with limited English skills, who was still very friendly and a woman who spoke perfect English, who was also friendly. The one thing that was mildly disappointing was the breakfast, which was a slice of toast and a cup of coffee. This was not what I had in mind... aside from that, it is well worth the money.